Add a fun touch to your bedroom decor with the Cute Owl Decorative Pillow. 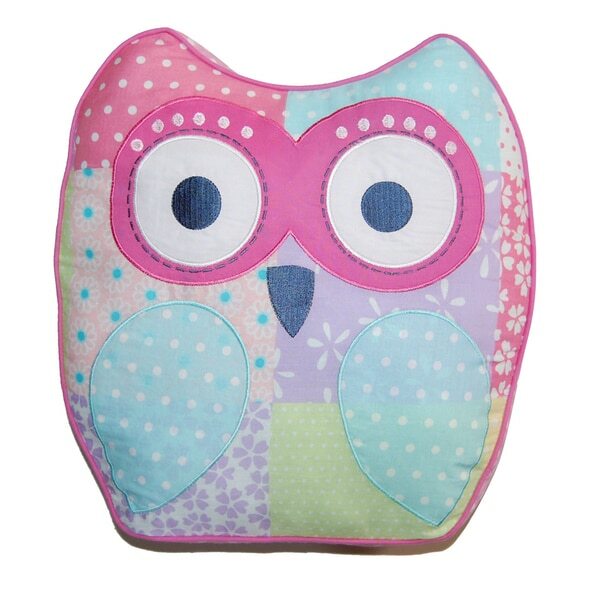 With its cute pattern and cotton material, your little one can enjoy this lovable pillow for years to come. Great little accent pillow to compliment a little girl's bedding. We ordered the Cozy Line Greta Pastel Cotton Quilt Set and this owl pillow added a pop of color and whimsy to the space. We wanted to pull out more turquoise and this helped. Definitely worth the price! I bought this pillow for both my granddaughters. They had different quilts, both with owls on them, and this pillow matched them both. They loved them! It is also good quality. My four year old granddaughter loves owls and has not put this pillow down since it was delivered! I ordered it to match the three piece quilt set that I chose for her first big girl bed. The pillow is soft but well filled and It is very well made. I bought this pillow and the matching quilt as a birthday gift for my granddaughter. It is very well made. The material is nice and it is as cute as it looks here. Very happy with the purchase. This pillow was much larger than I had expected, which is a good thing! It is very well made and looks adorable on the bed. It matches the bedding perfectly, too. I'm so glad that I purchased this pillow and recommend it highly to anyone interested! I purchased this to go along with my daughter's Pink Owl 3-piece Quilt Set. Very happy with the purchase. The pillow was nicely made and good size. It looks beautiful on her bed. Very cute pillow and firm. It completes the look of the room with the cute bedding. Looks cute with the quilt set! And durable! They complete the set! And go cute with the sheet set and other pillows also in this set. My daughter loves them. Absolutely adorable! Love it with the matching three piece quilt set! High quality and precious in our granddaughters room! My granddaughter loved this with the matching quilt! It was her birthday, and she loved the owl theme and colors! Very pretty! Nice addition to the set. Great quality. Just received this today and it's absolutely adorable! The colors are bright and cheery too. I love this set and it's just as nice in person as it is in photos. very cute, I matched it with the cozy line pastel quilt set. My daughter loves it and goes great with her bedding. Because I tink my grand daughter will like it and we can have pillow fights, or at least pillow tossing fights!